In preparation for my new little baby girl to arrive, Megan and I had an idea. 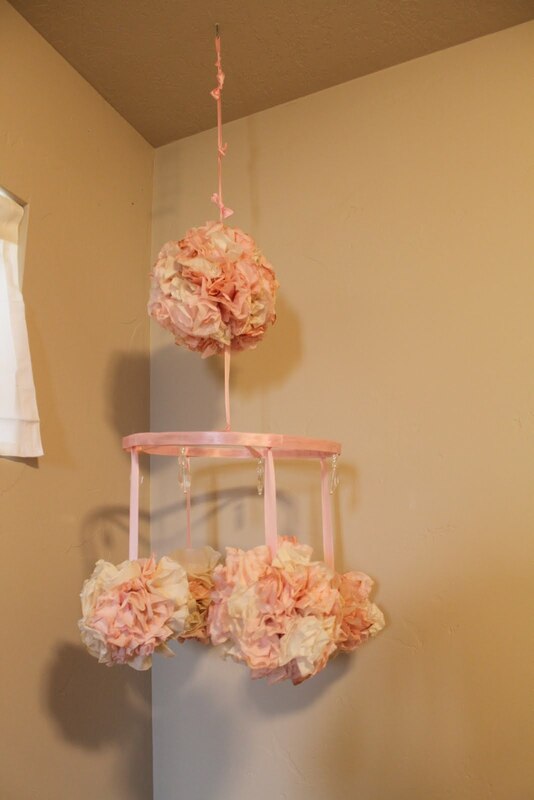 Why not make the baby a stationary mobil out of those coffee filter flower balls? We had seen these in wedding magazines and decided to take our on twist on the idea. We decided not to hang it directly over her crib, and you will understand why when you see what it took to put it together. Beads and pins are probably not the best thing to hang over your baby's crib, so it's now just a fun and cute baby girl room decor item. We got the basic flower ball making instructions from here but we adjusted it a bit to work for us. Boil a big pot of water and divide it into two separate bowls. Put 3 tea bags in each bowl and seep. In one bowl, add red dye to turn it pink. We used about 10 drops to get this color. Leave the other bowl the color of the tea. Dip half of the coffee filters in the pink tea bowl and the other half in the other tea bowl. Dyeing the coffee filters with tea rather than just water gives them an aged look. Lay out the dyed coffee filters on cookie sheets. It takes about a day to dry. If they don't dry fast enough, put them in the oven on the lowest temperature and rotate them every so often. Keep a close eye on them so you don't burn your house down or something horrible like that! 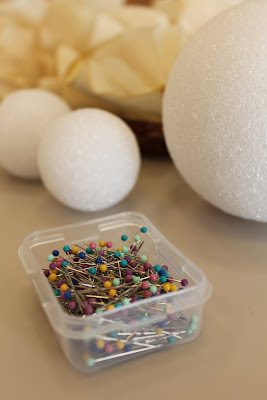 Take your styrofoam balls, your dry coffee filters, and your pins. Take a coffee filter, fold it in a bit to make it look like a flower, and pin it to the ball. For the smaller balls, you can cut off the end of the coffee filter and make it shorter so it's easier to work with. Alternate between the pink and the cream coffee filters as you see fit and fill-in the entire ball. Take your earring head pins, beads, and needle nose pliers. 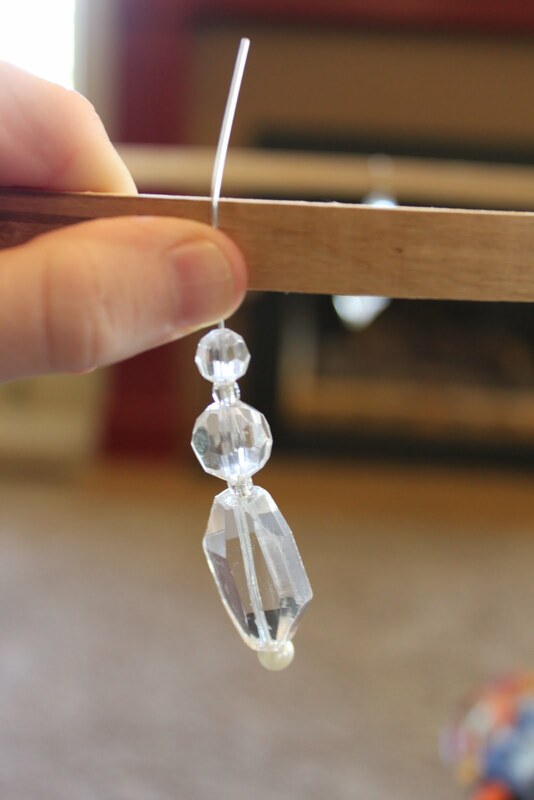 Earring head pins are found in the bead and jewelry section of Roberts Crafts or Joanns Fabric. 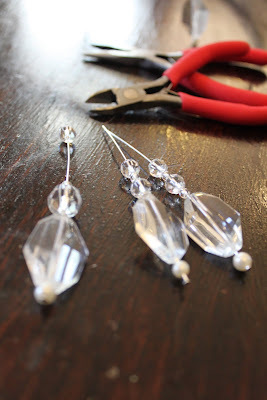 Arrange the beads onto the head pins however you like. 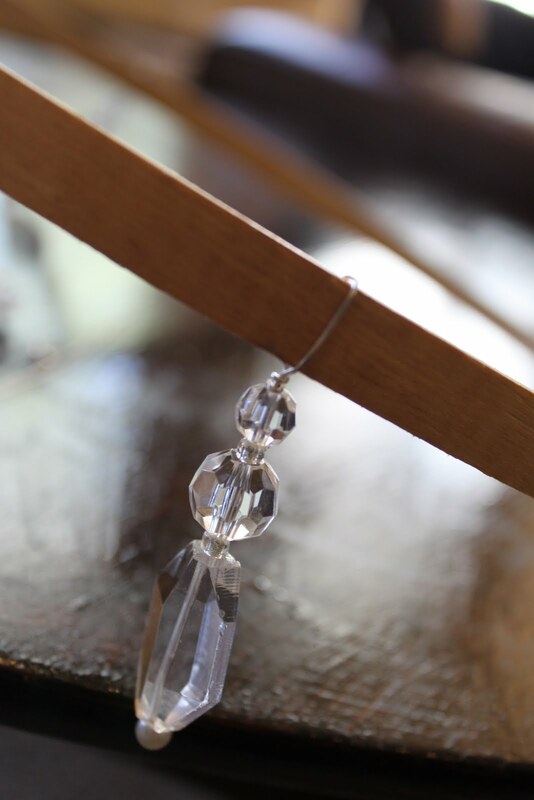 Place the earring head pin on the hoop in the desired location, and tightly wrap the head pin around the wooden hoop and then around itself with the needle nose pliers to secure it in place. We used four decorative head pins and spaced them out evenly around the hoop. You can hot glue it into place if you'd like. Pin a desired amount of lace to your 4 smaller flower balls and then tie the lace to the wooden hoop. Make sure to space it out evenly; a flower ball in-between two beaded head pins. Take your hot glue gun and glue ribbon on the front of the wooden hoop and also on the inside or back of the wooden hoop. Cut two lengths of ribbon about 12 inches to fit across the center of the hoop, making a cross. You want this to be tight and not droopy, so cut the ribbon shorter or longer if you need. Hot glue into place. At the center of the cross, tie another piece of ribbon securely. The length of this ribbon is up to you. At the other end of that ribbon, pin the large flower ball and secure it in place. Take a longer length of ribbon. Pin one end to the top of the flower ball. Tie some cute bows up the ribbon or just leave it be. At the end, tie a loop and hook it to the screw hook in the ceiling. And your done! This is adorable! If my baby is a girl, I'm so doing this! Love it! oh steph, so adorable!! i hope i'm having a girl again! Super cute! I want to have a girl!! Thank you so much for sharing this! My baby girl is due in Feb and I cannot wait to make this perfect adorable mobile for her nursery! I just love this. I have made a coffee filter wreath and lamp. Next coffee filter project is def. this!! Thanks for sharing!